Seeman, a fierce supporter for rehabilitating the internally displaced Sri Lankan Tamils, seems to be lying low these days. While Kollywood rumors suggested that Seeman will direct Vijay in a flick called Kobam, Seeman begs to differ when contacted. 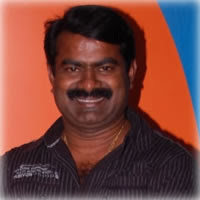 As a reply to the Behindwoods correspondent’s question in this regard, Seeman said that he is not in the right mood to direct a movie now. “I’m only finishing up my earlier agreed projects, since I can’t wriggle out of them now,” he further added hinting that he might take a break from his directorial / acting career.